IP Spoofing - The Untracable HACK! The term IP spoofing is a combination of two different words IP + Spoofing . IP refers to the connectionless protocol which is responsible for the process of routing up the data packets over the network . Since it is a connectionless protocol hence there is no acknowledgement received to the sender of the message that the it has been received without any flaw at the receiver end. 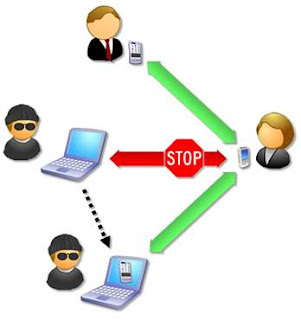 The term spoofing means that the attacker sends the message to a computer indicating that it has came from a trusted source . Hence IP spoofing is the concept of spoofing the identity of a trusted source(victim) and to gain access at the same privilege at which the victim is. system without a User ID or password. many network attacks that do not need to see responses (blind spoofing). The heart of network connectivity over the internet is based on the TCP/IP protocol which collectively describes how a connection is established and how the data will be transmitted over the network . Here I will briefly tell the aspects of IP and TCP that are exploited in order to perform the attck. Here are the models of TCP and IP headers. Obviously, it's very easy to mask a source address by manipulating an IP header. This technique is used for obvious reasons and is employed in several of the attacks discussed below. Another consequence, specific to TCP, is sequence number prediction, which can lead to session hijackig or host impersonating. • Selecting a target host ( or victim). • The trusted host is then disabled and the target’s TCP sequence numbers are sampled. authentication (no user id or password). It is the most sophisticated attack in which the sequence and acknowledgement number are to be determined randomly . The attacker tries to send random packets to the victim in order to examine the pattern of sequence numbers . Modern operating systems use random sequence number generation techniques which makes it very difficult to analyze the sequence and acknowledgement numbers by sending packets. This type of spoofing attack can be performed when both the victim and the attacker are on the same subnet . Then there is a plus point for the attacker as the acknowledgement and sequence number can be sniffed , and hence the hard work of calculating and analyzing them manually is removed. This attack is well understood with its name itself . In this type of attack two trusted sources are involved in a communication when the attacker spoofs the identity of one of the trusted sources . The attacker then controls the flow of communication between the two trusted sources and can even fool the recipient to give confidential information. The attacker can also manipulate the data transfer that is taking place between the two trusted sources. The countermeasures to spoofing will totally depend upon the type of attack and the network setup. Still some of the basic features that can be implemented to prevent IP spoofing attack are by providing encrypted authentication , packet filtering at the router and implementing application based authentication . the head of animals, including human being.